West Quay Southampton has such a large and great range of shops, sometime it's hard to pick out the things I like the best, so thanks to a couple of good stylists who hand picked some staple items from some of the stores, I was able to choose my favourite winter wardrobe must-have's! 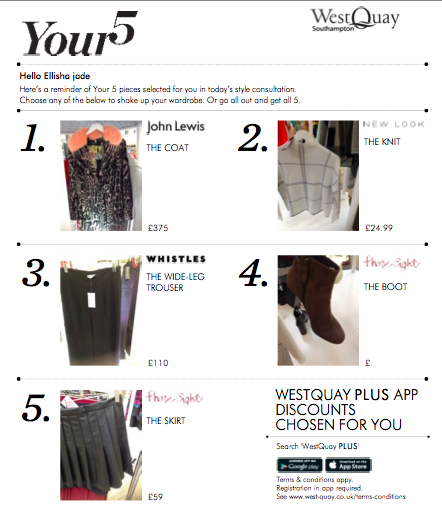 I always find shopping difficult and end up buying things that don't match or don't go with anything else in my wardrobe, so thanks to West Quay I got to have a stylist help me to choose my Five favourite things for the winter season. I also had a make artist show me the new trends for colour and some new highlight products. We started off choosing my favourite items of clothing (while scoffing a Krispy Kreme donut obviously) and i loved the personal aspect of having someone help me choose based on my style and body shape. I love coats, so it was hard for me to choose just one seeing as i have a billion at home..... All the things i chose were documented on their iPad, with a photo and the price of each item so i knew where it was from, and this was emailed to me to keep! I then went and had my face done by the lovely makeup artist, who showed me how to use some of the new powders and highlighters as well as eyeshadow. My favourite of the makeup was the eyes, and this was the 'Cool Palette' from MAC (in John Lewis) using the silvers and blues. I also liked the peachy colour of the MAC lipgloss! I ended up buying the MAC eyeshadow 'Cool Palette' the day after because i loved the colours that much and thought i would treat myself. Ill be back to find my favourite winter items soon West Quay! See what i chose in my experience below, something might take your fancy! Event and complimentary voucher in collaboration with West Quay, as they clearly know how much i need the fashion help!